I'm always up for a good challenge! However, occasionally the same challenge repeated over and over can get a bit old. For instance... getting a rainbow of foods into a certain 18-year old boy shouldn't be so hard. As a high school graduate (one with honors at that...), someone who lives for physical fitness, and one who has been counseled on nutrition his entire life by his mom, it shouldn't be such a challenge to get those good foods into his still growing body. But it is. Which leads me to my next challenge... one in which Girard's Dressings sent me a lovely care package along with a challenge to feature the dressing in some way other than simply dressing salad greens. With both challenges on my plate, I think I've come up with a fabulous merger... one that features Girard's Olde Venice Italian Dressing in a fresh no-cook tomato sauce (reminiscent of our days in Venice I might add...) and one that will bring a bit of that rainbow of plant-based foods into my 18-year old boy. While my son has never really been a tomato fan, he does love everything tomato sauce or salsa. Go figure. Hence, pasta with tomato sauce has been an 18 year vehicle to add veggetables to the table and have it gobbled up without question. Living in San Diego I wait all year for tomato season, and right now it's at its peak. 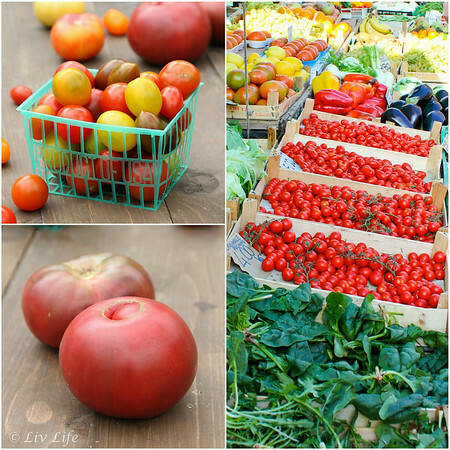 Tables lined with sometimes oddly shaped and oh, so beautiful heirlooms have me arriving home from our weekly farmer's market with bagfuls of tomatoes, and as such, tomatoes enter our menu nearly every day. San Diego Heirlooms on the left... Italian Romas in Venice on the right! But back to school, dance and work schedules have my family eating dinner at different times, bringing make-ahead meals back onto the menu board. Enter our no-cook tomato sauce. Easy enough that my son could actually put it together himself should he be so moved (he wasn't...), and even easier when prepared ahead and simply added to freshly cooked pasta (he felt this option worked better for him). 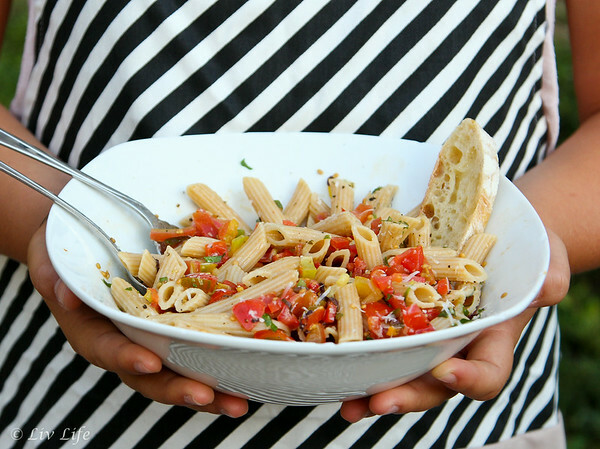 Even my husband gushed as he arrived home from a week on the road claiming the sauce brought him back to our days wandering the canals of Venice where aromas of basil, garlic and tomatoes frequently fill alleyways as restaurants serve up their finest. Thanks to Girard's - a company with a history closely paralleling my own (we both began in San Francisco, spent time in San Rafael and made our way south to San Diego) - for bringing a bit of my childhood into the kitchen. With a recipe dating back to the mid 1930's, my mom says her father actually ate at Girard's French Restaurant on Ellis St., in San Francisco, where Girard's Original French Dressing came to be. Easily recognizable in their familiar triangular-shaped bottles, Grirard's was a staple in our kitchen when I was little, and I smiled as my neighbor's 11-year old daughter pointed to the Champagne Dressing exclaiming, "Oh! That one's my favorite!". Her smile grew even larger when I handed her the bottle to take home after she helped me style and shoot a few photos. 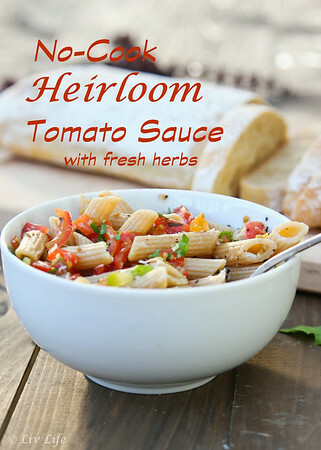 Versatile and easy to make ahead of time, this No-Cook Tomato Sauce has been on our menu twice in the last week, and one night my husband spooned the sauce bruschetta-like over toasted ciabatta for an early evening appetizer with a glass of Italian wine. While any tomato will work in this sauce, take advantage of summer heirlooms for their vine-ripened textures and burst of summer flavors. 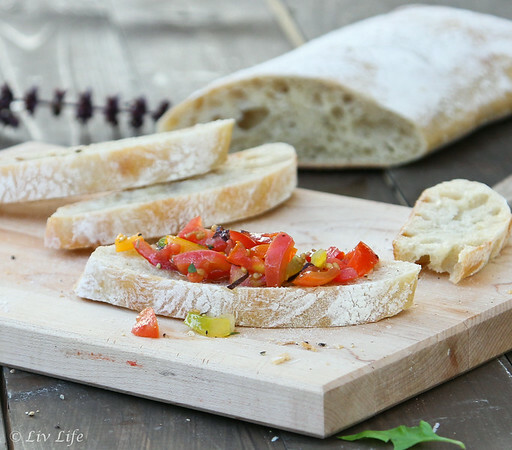 Make ahead for easy dinner prep, or serve over toasted ciabatta for a fabulous appetizer. 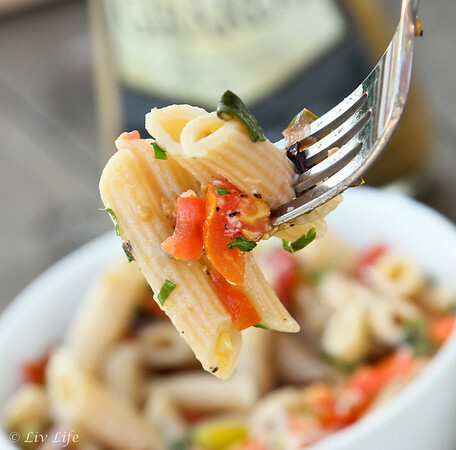 The Olde Venice Italian Vinaigrette brought a nice zest reminiscent of Olde Italy to the sauce while allowing the summer tomato and herb flavors to shine through. This recipe proves to be exceptionally versatile, adjust your favorite ingredients to your taste, or use different herbs based on what you have on hand. Place tomatoes through salt into a medium (non-reactive) bowl. Gently stir to combine. Refrigerate and allow to rest (the tomatoes will release their juices and the flavors will meld beautifully!) for about 4 hours. Prepare the pasta and drain. Place hot pasta into a bowl and add tomatoes. Spoon into serving bowls and top with freshly grated Parmesan and freshly ground pepper. Garnish with a sprinkle of finely chopped basil or parsley. Enjoy! Liv Life Note: The tomatoes also work as an incredibly flavorful appetizer when spooned over toasted chabatta. Liv Life received 4 bottles of Girard's Dressing for this challenge and this recipe is entered into a contest for the 2014 Seattle International Food Blogger Conference. All thoughts and opinions are those of Liv Life. You'll love it Mom Chef!! Takes you right back to the streets of Italy! Sounds like a dish that would please my family, too! And how neat that your grandfather ate at the restaurant where this salad dressing was first served! My Grandfather worked downtown San Francisco for some 30 years... he had some fabulous stories!! I am a huge tomato fan and would love to gobble up every dish. ohh... i m totally addicted to tomatoes! nice recipe! I have a bunch of heirloom tomatoes and this is the perfect way to use them! I love packing my pasta full of veggies! This recipe looks amazing! Oh man, this looks stunning. Fresh, light, and healthy. Fantastic. I'd love a bowl. I wait all year for tomato season too! Some of my tomato plants are doing great, a few not so good :-(. But I love to go see if there are any new tomatoes to harvest. So, so, good. And perfect for this fresh no-cook tomato sauce! 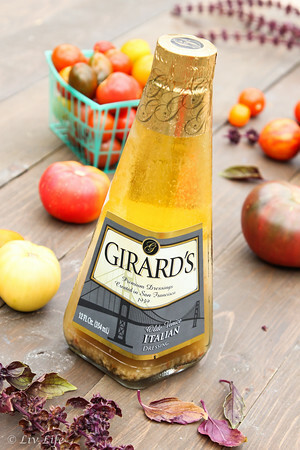 Loved hearing about the history of Girards, as that was the dressing I grew up with :-) This looks so yummy, and since tomatoes are one food my whole family loves, this recipe would be a hit! Not sure if you shop at Jimbos or not, but they currently have my all-time favorite dry farmed tomatoes in stock. Swoon!! !